Indology is a colonial product. Beginning in the 18th century as a way of understanding the colonised people, it evolved into a discipline for programming the Indian mind by telling Indians how they should think about their history and culture. Indology had two wings-the Aryan myth and the study of Hinduism. The collapse of the Aryan myth brought Hinduism studies into focus. This was accompanied by a shift in geography-from Europe to American academia, to departments like religious studies and theology. The result is a curious anachronism: academic articles and books on Hinduism echo the stereotypes and prejudices of 19th century colonial scholars and missionaries. The difference is that many Hinduism scholars today appeal not to the Bible or the White Man’s Burden, but to what they claim to be Freudian psychoanalysis. As they see it, Hindu scriptures, rituals and practices are rooted in sexual fantasies. 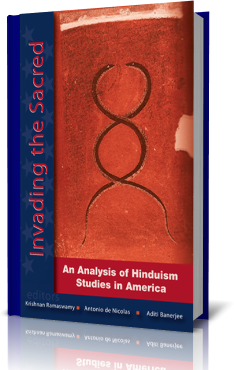 Invading the Sacred is a scholarly response to this brand of Indology. Its contributors, who come from disciplines ranging from philosophy and religious studies to clinical psychology, include Indians and non-Indians. The professional psychologist contributors dismiss Indologists’ claims of Freudian analysis as little more than ideas dressed up in pop psychology jargon. Many others find Indologists to be seriously lacking in their knowledge of original sources and languages. To their credit, the authors maintain a sober tone, avoiding polemics while discussing Indologists’ claims. Instead of accusing Indologists of anti-Hindu bias, Arvind Sharma suggests that their work could be scientifically tested for bias by applying statistical methods. Bias detection is a well-understood statistical technique. S.N. Balagangadhara observes that western humanities, for all their denial, cannot free themselves from their roots in Biblical scholarship; they can only function as secular theologians. Invading the Sacred shows that western Indology is on its last legs. Indology departments in Europe are shutting their doors-Cambridge and Berlin being the latest. It is only a matter of time before American Indology programmes follow suit. Interest in India is at an all-time high, but these Indology scholars living in a time warp do not meet today’s needs. As purveyors of colonial products, they are doomed by their irrelevance. A work like Invading the Sacred was long overdue. But why did it take so long? Why did it come from Indian and non-Indian scholars based in the west, and not from the Indian academia? Do Indian academics still feel beholden to western scholarship, which they dare not challenge? What are ICHR, the ICSSR and other sundry government-funded organisations for, if not for bringing forth new ideas and developing new schools of thought founded on Indian sources? Post-Independence India is notorious for forcing its best scientific brains to leave the country in search of fame and recognition in the west. Invading the Sacred suggests the same to be true of the humanities and social sciences. It is doubtful whether, in the prevailing climate, the authors in Invading the Sacred could have survived in the Indian academia. The publisher should be complimented for bringing out such an informative and provocative volume.